One of the challenges facing learners in rural South Africa is the inability to attend classes on time owing to the distances they have to travel to get to school. In many instances, learners who live long distances from a school end up being absent from classes because they cannot cope with travelling these long distances on a daily basis. #Bikes4ERP seeks to address this challenge and to ensure that absenteeism caused by distance travelled to school is minimized. This report covers progress made with regards to the #Bikes4 ERP programme initiated through ERP eleven months ago within the Blouberg Municipality, Limpopo Province. In total, eighty-six bicycles were distributed to 5 schools within the Blouberg. The impact has been monitored based on academic performance of the learners, their rates of attending classes and a general assessment of how each learner has been impacted by receiving a bicycle. One of the outcomes of the evaluation report from 2016 was the realization that a number of learners were not making use of their bicycles owing to breakdowns and damages of different circumstances, mainly as a result of the very bad roads traveled.. Even though a mechanic had been appointed to assist the learners, some learners were not able to advise him of the pending repairs timeously so that he could offer his services to them. In order to address this, the P.E.A.C.E. Foundation resolved to directly contract the mechanic, Mr. Samuel Matheta, from February 2017 until December of this year. This means that Mr. Matheta has a contractual obligation to visit all five schools on a regular, predetermined schedule, to not only repair broken bicycles but to also monitor how the learners are using the bikes and that they meet their academic and attendance obligations. He has direct contact with all the principals at the schools, which enables him to access all the class registers and academic records, crucial for the overall monitoring and evaluation of this project. To date, about 40 bicycles have been serviced and repaired for a range of issues including punctures, wheel hubs and chain and seat replacements. We can conclusively report that out of the 86 bicycles, 54 are currently being used by the learners, with the remaining 32 awaiting to be collected and reallocated as the learners who were using them have since matriculated and left high school. 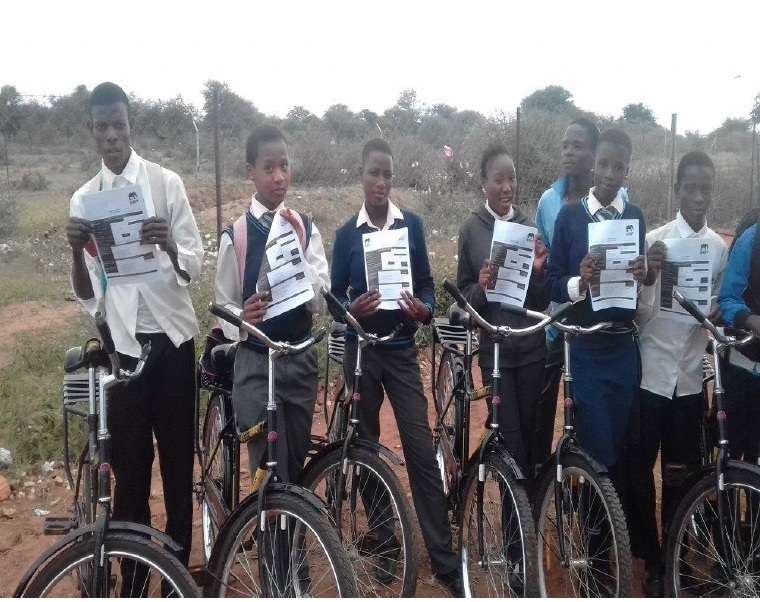 We agreed that for the benefit of all students from all schools, learners who either do not make use of the bicycles or later leave high school after completion of their studies will have their bicycles taken and reallocated to other students in order to benefit as many students as possible at any one time. To this end, all students were given a new contract to sign so that they agree with such clauses to do with ownership, maintenance and use of the bicycles on a day to day basis. All fifty four learners signed the contract. This is an indication that they also see the value in assisting as many fellow students as possible travel to school and attend their classes. The collection of the remaining 32 bicycles will commence on the 20th of March, as this is an exercise where Mr Matheta will have to go door to door to all 32 students who matriculated in 2016. The reallocation of these bicycles will then be completed by end of March 2017. Based on the records received in 2016, learners who benefitted from #Bikes4ERP initiative were generally attaining good academic grades overall, and have been attending classes more frequently than those who do not have bicycles. In order to have a better-informed impact, we gave the 54 learners a questionnaire and the feedback was also very positive. One student indicated that she travels to school four times as much now using her bicycle, having taken over an hour before and now takes about 15 minutes. Another learner indicated that he now takes 30 minutes to travel a distance which would take him over 80 minutes. Tebatso Mosofega, a Grade 12 learner interviewed directly by Mr. Matetha was grateful to have received the bicycle, as she does not have to worry about waking up very early in order to catch public transport to get to school. She simply gets onto her bicycle and gets to school on time. Apart from these impacts, the bicycles are also benefiting social bonds within the community as the learners are now able to visit their friends and family and also assist with household chores such as buying day to day utilities at home. The mechanical challenges alluded to by most of the learners have since been addressed by Mr. Matheta as these were experienced prior to him being contracted to service the bicycles. We will be able to report again on the academic performance and school attendance of the learners within the next three months since all bicycles have now been fixed and are in good working order. Interim updates will, however, be provided monthly.